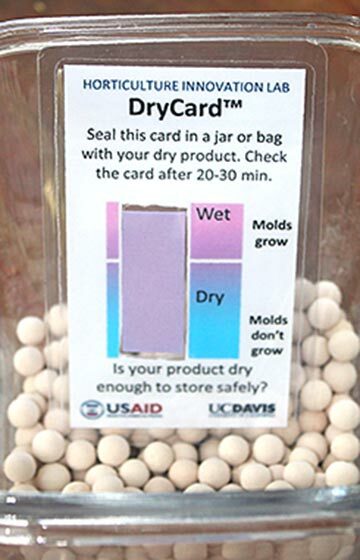 The tool, called the DryCard, shows farmers whether their dried food products are dry enough to store safely, reducing food losses and risks of mold and associated toxins. In March, it beat out more than 200 entries to win the grand prize in the All-Africa Postharvest Technologies and Innovation Challenge at the first All-Africa Postharvest Congress and Exhibition in Kenya. During the challenge, DryCard and other technologies and innovations were pitched to an audience of about 600, including private investors and international organizations. “I have never seen such strong interest in a technology like this,” said Elizabeth Mitcham, director of the UC Davis Horticulture Innovation Lab and a UC Cooperative Extension specialist in postharvest biology for the UC Davis Department of Plant Sciences. She noted that much of the interest in DryCard has come from organizations that also work with staple crops. The pair’s solution is about the size of a business card, with a strip of cobalt chloride paper that changes color based on humidity, a color index and directions. With a DryCard and an airtight container, farmers can easily test a sample of their product for dryness in 20 to 30 minutes. So far, the Horticulture Innovation Lab has offered samples of the DryCard in multiple languages to researchers who can try the tool out in real-world situations. Bertha Mjawa is one of the first researchers to test and promote the DryCard in Africa, during her work with the Market Infrastructure, Value Addition and Rural Finance Program of the Tanzania Prime Minister’s Office. The recent All-Africa top innovation award was accompanied by a $5,000 prize for promoting and scaling out the DryCard. The research team hopes to connect with entrepreneurs who are interested in manufacturing and selling the cards. The researchers estimate that approximately $70,000 could help the DryCard spread among seven African countries. Read more about the first All-Africa Post Harvest Congress. The Horticulture Innovation Lab builds international partnerships for fruit and vegetable research that improves livelihoods in developing countries in Africa, Asia and Central America. The research program is led by UC Davis with funding from the U.S. Agency for International Development, as part of the U.S. government’s global hunger and food security initiative called Feed the Future. Including the Horticulture Innovation Lab, UC Davis leads five Feed the Future innovation labs focused on improving agriculture to reduce poverty — more than any other university.